Here's another recycling and flower making project, inspired by a natural landscape. 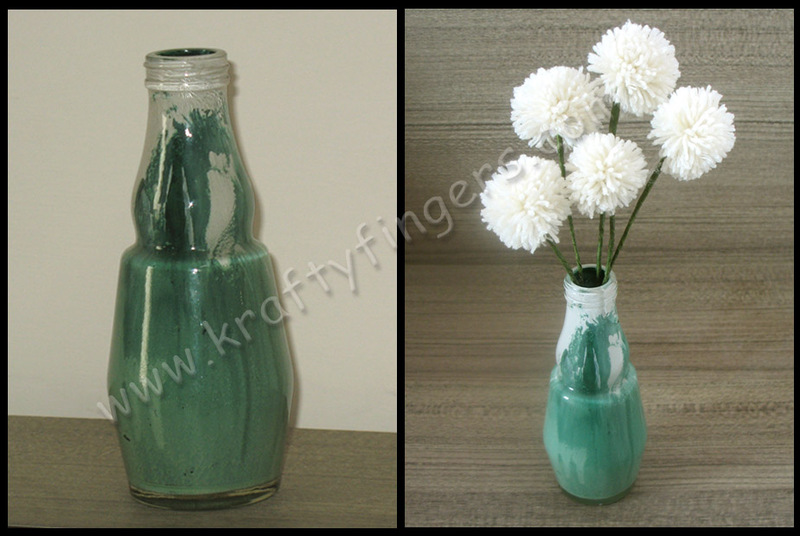 I tried to capture the feel of the snowy alpine forests in this chilli sauce bottle, recycled into a vase. I used white enamel paint to make the snow top first, and once it had dried, I poured in some green paint, and twirled it around to make the forest cover. Then I decorated this recycled glass jar with some handmade flowers made out of wool pom poms, tied onto stems of aluminum wire covered with green self-adhesive tape. Doesn't it make for a pretty piece in home décor? This "Snowy Alpines" best-out-of-waste project is a part of the "Limited Edition Collection" here. Please order immediately if you are interested in this product.